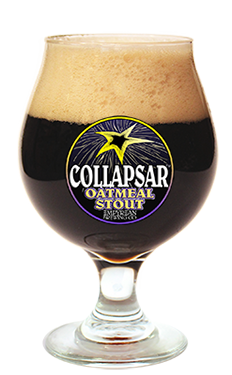 Collapsar Oatmeal Stout – Empyrean Brewing Co.
Can you escape the pull of Collapsar Oatmeal Stout? Coffee-like roasted flavors are smoothed by the addition of oatmeal. Like our Irish brethren, we infuse our stout with nitrogen gas for a creamy head that “collapses” when poured. Pair with prime rib, southern BBQ, shellfish and chocolate or vanilla desserts.